Welcome to my irrational fear that makes me so uncomfortable that I have never allowed myself to think about it for very long. I wince when I consider it. Perhaps I should start with a little backstory. When I was about seven years old, I had a series of night terrors where I would wake everyone in my family up at night because I was screaming horribly. The dream always started the same, with me being within one of five beams of light that appeared to be both moving and still, somewhat eternal or infinite I guess. But I’d be hurtling through space, then veer of towards Earth where I was suddenly me, as a child, in a weird dystopian service station somewhere. Eventually, the dream always ended when some space technology that had been harnessed and not fully understood would go haywire and there’d be repetition that was speeding up exponentially until I woke up FREAKING OUT. I also hated (and still hate) night time windows being uncurtained because I don’t want things looking in. And also, I don’t like to look up at the night sky in case I see something I can’t explain. These things have bothered me for a really long time and there was one day in my teens that I wondered if I had been abducted, and I immediately stopped thinking about it. 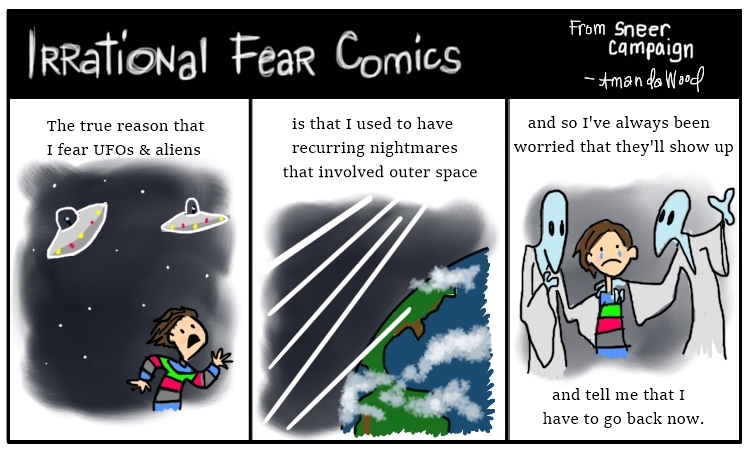 But by now, I worry about what if I am actually an alien and that’s why I don’t understand screaming or dancing. And why I see people in buffet lines and feel like I am observing livestock. Have I forgotten who I am and why I’m here? Have I gone totally insane, or am I just really close to it all the time? Halp.